The 396th Bombardment Group is a former United States Army Air Forces unit. 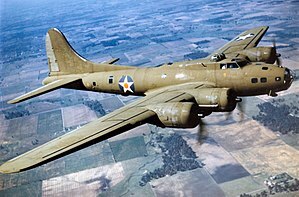 It was active during World War II as a Boeing B-17 Flying Fortress operational training unit, training newly organized units, then as a replacement training unit for aircrews. It was inactivated in 1944 in a general reorganization of Army Air Forces training units.. The 396th Bombardment Group was activated at Mountain Home Army Air Field, Idaho on 16 February 1943 with the 592d, 593d, 594th and 595th Bombardment Squadrons assigned. After initial organization and equipping with Boeing B-17 Flying Fortress heavy bombers, the group moved to Moses Lake Army Air Base, Washington. There the 396th acted as an Operational Training Unit (OTU) for B-17 units. The OTU program involved the use of an oversized parent unit to provide cadres to "satellite groups" In August 1943, the unit's mission changed to being a Replacement Training Unit (RTU). Like OTUs, RTUs were oversized units. Their mission, however was to train individual pilots or aircrews. In November 1943, the 396th moved to Drew Field, Florida, where it would remain for the duration of its active service. However, the Army Air Forces was finding that standard military units, based on relatively inflexible tables of organization were not well adapted to the training mission. Accordingly it adopted a more functional system in which each base was organized into a separate numbered unit. The 592d was inactivated on 1 May 1944 at Drew Field, Florida. Its personnel and equipment became part of the 326th AAF Base Unit. Activated on 16 February 1943. ^ See Mueller, p. 351 (simultaneous inactivation of 396th Bombardment Group units and organization of 326th Base Unit). Craven, Wesley F; Cate, James L, eds. (1955). The Army Air Forces in World War II (PDF). Vol. VI, Men & Planes. Chicago, IL: University of Chicago Press. LCCN 48003657. OCLC 704158. Retrieved 17 December 2016. Mueller, Robert (1989). Air Force Bases, Vol. I, Active Air Force Bases Within the United States of America on 17 September 1982 (PDF). Washington, DC: Office of Air Force History. ISBN 0-912799-53-6. Retrieved 17 December 2016. This page was last edited on 21 January 2019, at 12:15 (UTC).